Save money on running costs with this great A++ Siemens fridge freezer, which consumes just 251 kWh per year – also helping to decrease your carbon footprint. It's also quieter than comparable appliances with a low operating noise of 42 dB(A) that keeps your kitchen and home a little more peaceful. Make the most of 241 litres of storage space in the fridge compartment, making the iQ 700 KG39FSB30 70/30 Fridge Freezer great for fresh food. Four strong safety glass shelves provide durable support for all your containers, dishes and other food items. Three shelves are adjustable to suit your storage needs. There are also three generous door balconies for your bottles, jars and similar items – use the lower shelf for tall things like soda bottles. 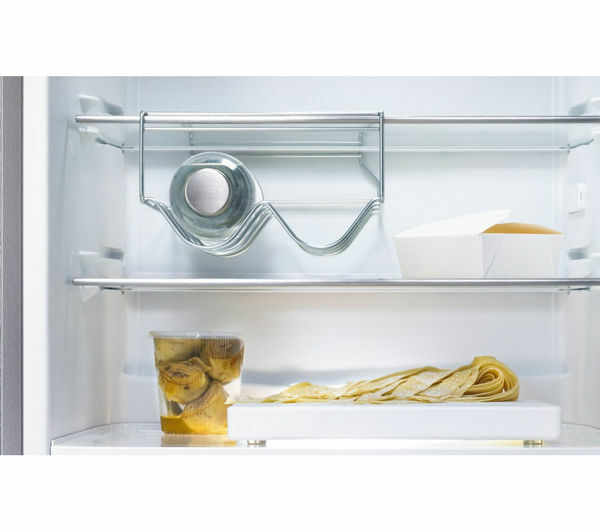 An egg rack is provided for those delicate items, and there's a wine rack to keep your bottles of white, rosé and champagne neat and tidy to maximise the inside of the appliance. The freezer spreads 68 litres of storage volume between three drawers. Keep all your meat, vegetables, desserts and more in great condition, easily checking on stock levels and conditions with the clear drawer fronts. Keep meat and fish in perfect conditions using the coolBox drawer, and enjoy crisper, fresher-tasting fruit and vegetables for up to twice as long with the hydroFresh drawer. This clever feature features a humidity control slider, a rippled base for improved air circulation and telescopic rails for easy insertion and removal. Relax – automatic defrosting in the fridge and frost-free technology spare you a lot of hassle and mess, as you won't ever have to manually defrost the appliance. 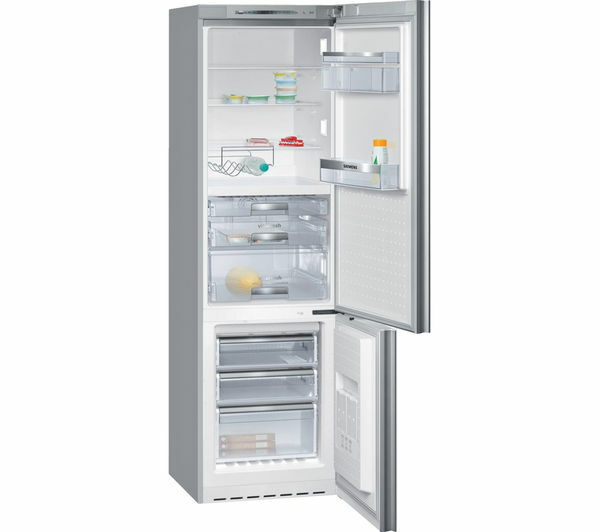 The supercool function allows the fridge compartment in your KG39FSB30 to rapidly lower its internal temperatures, ideal for when you're introducing newly-bought items and need to get them down to the right temperature – also protecting things you already have stored. The internal touchControl electronics let you operate all refrigerator functions easily, smoothly and accurately with the lightest of touches. 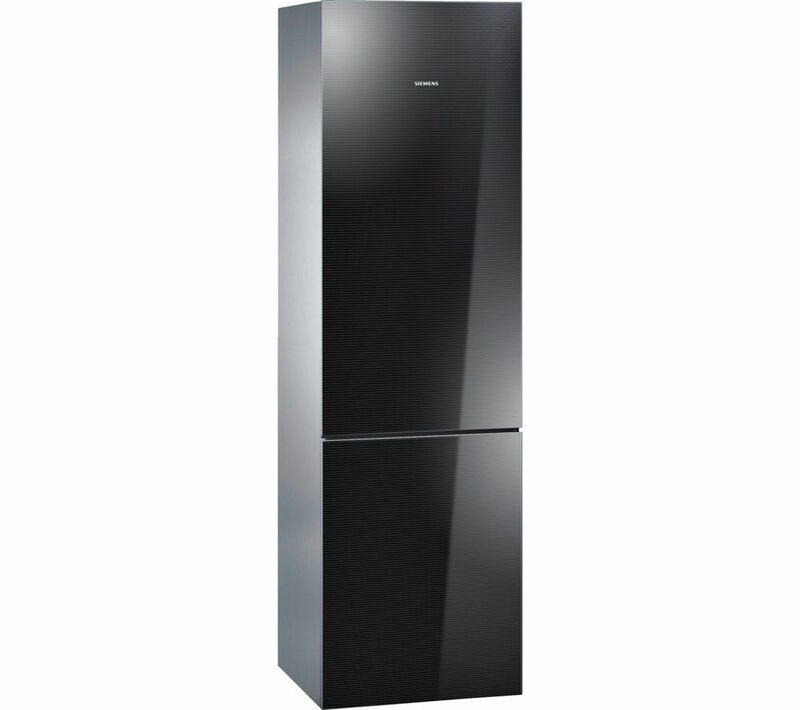 With its glossy black doors and chrome inox metallic side panels, the Siemens KG39FSB30 Fridge Freezer finishes off your kitchen beautifully. The integrated vertical aluminium handle lets you open the appliance easily, and the door hinges can be reversed to fit in with your kitchen's layout. Enjoy easy cleaning with removable magnetic door seals. Inside, bright LED lighting both saves on power consumption and brightly illuminates the fridge so that you can easily find what you're looking for, day or night. The external in-door LCD display allows you to monitor fridge and freezer temperatures and settings at a glance.